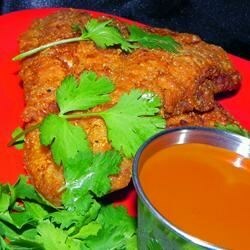 "Lightly fried and very flavorful. Sure to please all. Serve with lemon wedges and homemade tartar sauce." If I were to make this again, I would cut the corn meal in half and add 1 cup of flour and add some garlic, maybe some kosher salt, something to add some flavor to it.